We guard many different things in life – our money, our family, our pride. But, there is one thing that we sometimes forget to guard: our heart. When we let the things of this world pollute our lives and our heart, we can no longer shine His light to others the way God wants us to. Some of the ways that we can keep our hearts pure is by listening to music that pleases God, watching appropriate things, reading books that doesn’t use foul language, and spending time with people that will point us to Him. And, I know I seem to say this every time, but in order to keep our hearts pure we need to be, daily, in the word of God as well as praying. How can we shine His light and pour out His love the world if we aren’t, daily, renewed by the Spirit? Today, where do we, as a nation and as individuals, look for wisdom, knowledge, and understanding? Too often, we go to our friends, to Google, or to Siri, to everything except where we need to go. This verse tells us that we need to go to God and His Word. He is perfect, so we can trust Him to always be true and right. He’s loving and we know that He will always do what’s best for us and what will bring Him glory – even if it doesn’t seem like it at the time. At first glance, Proverbs appears to be a ‘do this and this will happen’ type of book. Well, in a way, it is. But, in other ways, it isn’t. It is not guaranteed that if you follow the Lord, your life will be perfect. We’re actually guaranteed the opposite. However, through those hardships, if we trust God and remember that He knows what is best for us, we don’t have to live in fear. Not because we don’t have struggles, but because we trust in Him who loves us dearly and is more powerful and wonderful than we can ever imagine. So, I’ve been away for way too long from this space. Lots of schoolwork and story writing can do that! 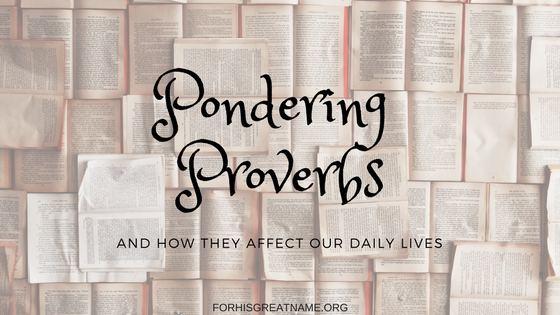 However, I’ve also been working on a great new series called Pondering Proverbs. I am super excited for this new series and I hope that you will be too. So, let’s find out what Pondering Proverbs is going to be like. WHO: I wrote the devotionals to accompany Proverbs. They are meant for me and for YOU. WHAT: One (in some cases two) verse(s) from a chapter in Proverbs and a short devotional about them. The first week’s verse will be from the first chapter, the second week’s verse from the second chapter, etc. WHERE: Right here! At For His Great Name. WHY: Proverbs is such a wonderful book of wisdom. I feel like we sometimes just skim over as we read the book…proverb after proverb after proverb and we don’t always (or at least in my case) take the time to stop and think about what God is trying to teach us. HOW: Through the internet, but, if you want to, you can email me any question and/or comments at alyssa@forhisgreatname.org and I’ll try to get back to you as soon as possible. I hope to see you all here next Tuesday for our first verse!